I am feeling a little better since my last update, although it has taken quite the roller coaster to get here. Its been a trying couple of weeks, culminating in the week from absolute hell this week. But, I feel as though I’ve come out the other side a bit stronger, and a bit more grounded, with many things that I want to work on. Tonight, I’m excited to say, my friend Nina and I are debuting our new dark fusion dance troupe, Dualitas. We will be performing at the Dark Arts market tonight, and have a brand new duet, custom made for this event. Its spooky and creepy, and amazing, and I cannot wait to dance it tonight. Its amazing how dance and music can bring you through things. I’ve found so much solace in music lately, I’m building myself a playlist on YouTube right now that is serving to inspire me, in a more primal way. I can’t really explain it. Many of the songs are either by Native Throat singers, or Pagan “folk/rock” groups. The music stirs something in me, that is just…primal. And beautiful. My dear readers, I thank you for your love and support. It makes me smile any time I see that someone has “liked” or followed my blog. I’m just a woman sharing her innermost thoughts for the sake of writing them down. I appreciate you all. Thank you. Until next time, when I will most definitely have more things to say, and more substance to write about. Can it truly be that as of today, I have been studying Arab dance for 15 years? Not quite a third of my life, and yet, I have difficulty remembering my life without it. Recalling days when some of my favorite artists didn’t include Oum Kalsoum, Abdel Halim Hafez, or Mohamed Abdel Wahab seems impossible. Remembering life before meeting all of the absolutely amazing friends I’ve met through the bellydance world and community is strange to me. Some of my very best friends are dancers. I was at the Bristol Rennaissance Faire, and I saw this woman dancing. She was just STUNNING. I’d seen belly dancers before, but never had I seen someone embody music the way she did…and she was only accompanied by a drum! I knew then that I had to learn from her. I waited until the show was over, and approached her, asking if she taught. She did, and said she would come back with a card. This was the day that I met my first teacher, Nadia Sahar. The first lesson that I took was, quite literally, life changing. I searched for and bought any music that sounded remotely like what was used in class. I fell in love with singers like Amr Diab and Hakim. I practiced every single day. From that first class on, I was unstoppable for a very long time. Searching for knowlege from multiple classes, multiple teachers, spending every waking moment either dancing or thinking about dance. I took a handful of workshops in Milwaukee and Chicago, with amazing, big name dancers. After moving to Las Vegas, my horizons expanded even more, as I was fortunate enough to join a troupe and perform with some amazing people. I took more workshops than ever, and attended my very first dance festivals. 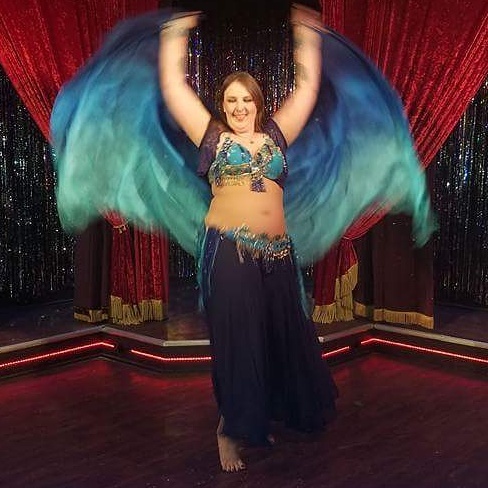 I even started teaching beginners classes, and was lucky enough to teach at the Las Vegas Belly Dance Intensive before it ended in 2015. I also competed for the first time that year, and made amazing friends and memories. I’ve slowed down a bit over the last few years, due mostly to my health, but my passion is still there. When given the choice, i would gladly listen to Arab music over anything that’s played on the radio today. 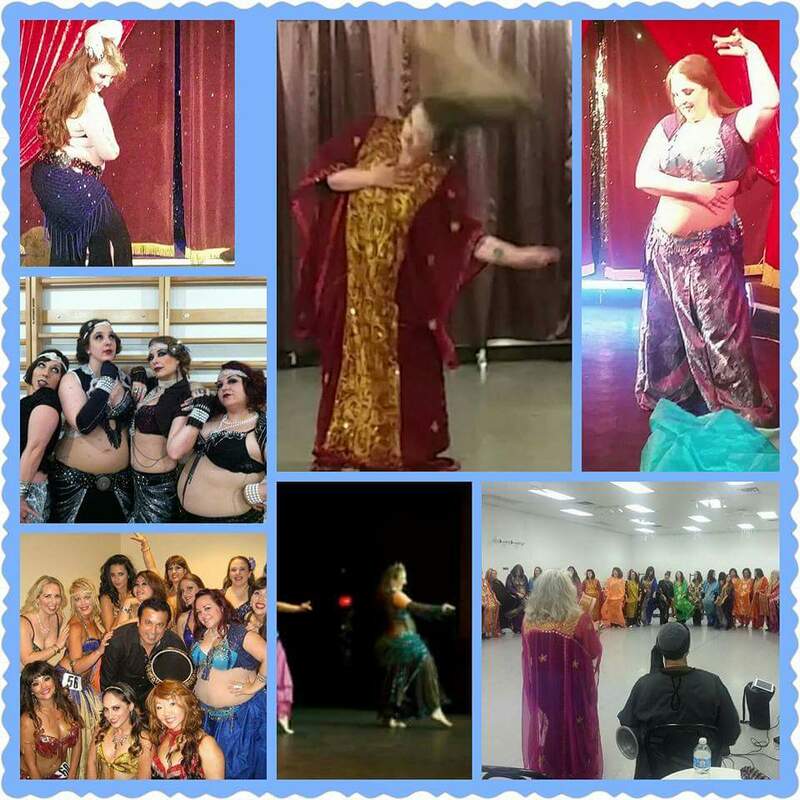 I’ve found performance opportunites within the belly dance community locally, and also with friends hosting charity fundraisers. I still take workshops whenever I can, and am travelling to a festival next July. How exciting! To my mentors, the teachers I have studied with in countless classes and workshops over the years. From the instruction of movement, to, folkloric dance, to Arabic words, songs, and music structure, to origins of the dance and music, you’ve given me a firm foundation to build upon. You’ve opened my eyes to the wonder that is Arab dance and music. You all make me want to be the best dancer that I can be. Your passion, your patience, your continued support, your feedback…I cannot thank you enough. Thank you for challenging me to grow. You inspire and amaze me. I cherish everything you’ve done for me and for other dancers, and hope that I make you proud when I dance. To the amazing teachers that I have only studied with for a short time/taken one or two workshops with over the years: Thank you for everything that you’ve taught me: choreographies, variations of movements, warm ups, Arabic words, drills, props, makeup techniques, facial expression, stage and spacial awareness, and so many other amazing things. Thank you for everything that you’ve taught me. Thank you for what you do, and for providing areas of growth and development, inspiration, and wonderful memories. To my peers: Other dancers, professional or just for fun, dance partners, troupe members, students…friends. Thank you so much for believing in me. For challenging me. For unbiased feedback about performances. For providing performance opportunites, and workshop opportunities. Thank you for listening and understanding when I post swoony things about dance and music. Thank you for your friendship. You also inspire me so much. I’m inspired by the dedication to doing what you love. This dance has changed my life in so many amazing ways. Here’s to the last 15 years, and also to many, many more.